Several sets of knobs are known to have been used on Lennon's 325. At the same time that the Bigsby accessories were installed another set of knobs was fitted. They were silver dome-topped, cream coloured radio/tv knobs, possibly Philips brand, and came from a TV/Hi-Fi store, on Whitechapel, just around the corner from Hessy's. After the refinish to black John settled on a set of Burns type plain aluminium knobs. These remain on the guitar to this day. The late George Harrison recalled going to a music store in Hamburg with Lennon to buy the guitar. rickenbacker325.net Harrison (as well as Rickenbacker) felt that Lennon bought the 325 from the Steinway music store in Hamburg. Chris Huston of 'The Undertakers' was told by John that he purchased the guitar from the Steinway Musikhaus. However, other sources maintain that it was actually purchased (actually Hire-Purchased) at Musikhaus Rotthoff. Very lastest information indicates that the later is likely the case. 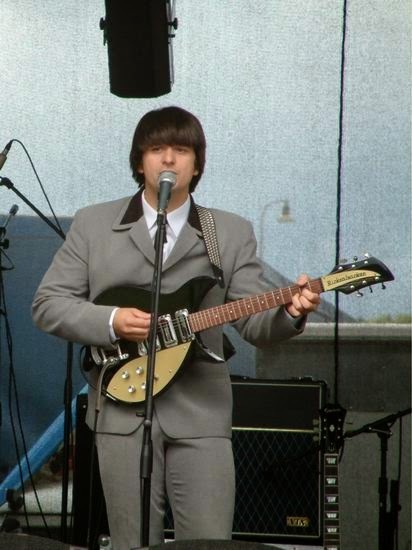 In any case, the Rickenbacker that Lennon purchased back in 1960 was a natural/honey finish 4/5 scale solid top guitar, alder body and neck, 2" thick with 1/8" ply back, single gold lucite control plate, four rotary controls with Rogan knobs, three 'short pole' toaster style pickups, Kauffman vibrola, standard 3 position pickup selector switch, extended jackplate, open backed Grover Statite tuners, and Rickenbacker open top roller bridge. Perhaps the first thing John did was get rid of the unattractive Rogan stove knobs. 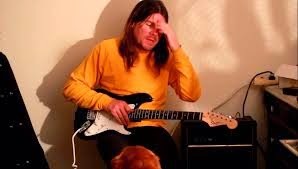 It appears that he was having trouble keeping them in place, as period photos clearly show the guitar with one knob missing on a number of occasions. Not always the same postion either. The first replacemants appear to have been four Hofner teacup style knobs. Further early Hamburg photos testify to this. Mr. F. C. Hall, of Rickenbacker, recalled four 325's going to Hamburg. One was sold to West German dealer Walter Hofner at a Chicago trade show in 1959, and in October 1958, John Lennon325 Guitar Rickenbacker shipped three maple finish 325's to Framus Werke in West Germany. John's guitar was one of these three. Shipping documents still in existance, confirm it. Aside from the famous ownership it is, in itself, an extremely rare guitar. It was one of only eight natural finish 325's made in 1958. It also is a solid top (no 'f' soundhole) which was not standard for the new 325 Capris. 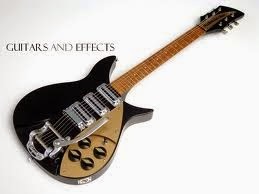 The other examples of '58 325's that are known to exist today all have a 2 O'clock 'f' hole, except for one natural finish model which appears to have been made alongside Lennon's. John's (and the other natural finish model) has an elongated jack plate of the type normally found on Combo type instruments. The reason being that the small jackplates we see in use on Rickenbacker's were introduced in 1958. For the first few guitars made, they appear to have been unavailable and so production 'made do' by using the existing longer plates but without the strap screw normally found on combos. Less than 10 instruments have this oddity. By about 'V90' the new square plates are in use. The serial number of Lennon's 325 - 'V81' is an interesting recent addition to our knowledge. It makes Lennon's the 2nd production Capri made. 'V80' being the start of production for '58. 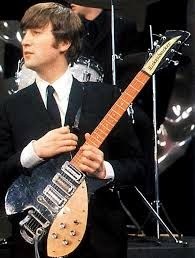 The fact that Lennon's was still sitting in inventory late in '58 while many of the other 2 control models had apparently been sold makes one wonder whether Rickenbacker was unsure of what to do with these unusual early versions (prototypes?) with no soundhole. The 2nd unit produced and yet still in stock months later. Facilitating it's use in at least one trade show that year. Suddenly an order for 4 325's just like the one seen at the show....off they go to Germany...problem solved. Guitar history takes a turn. All of these features make it an extremely unusual instrument indeed, some say the most valuable guitar on the planet. Much has been said and speculated about the 1958 Rickenbacker 325 used by John Lennon during the initial rise to fame of the Beatles. 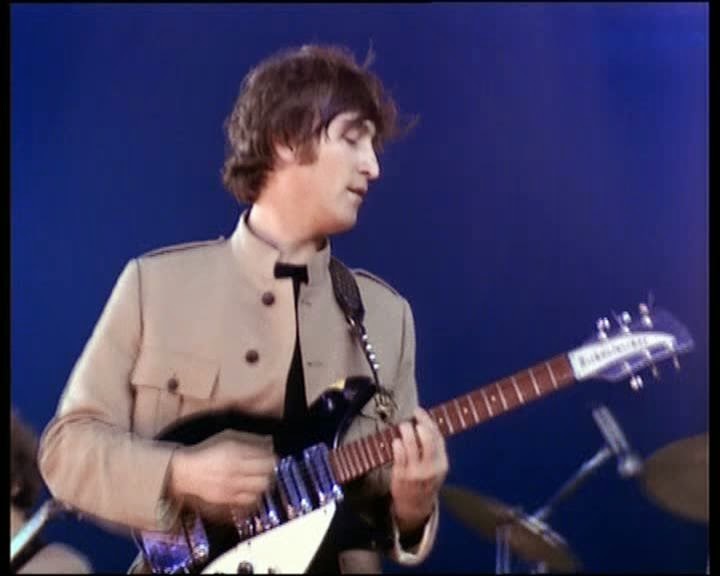 Perhaps what makes the famous 'Hamburg' 325 so interesting is the amount of speculation regarding such issues as it's original configuration, johnlennon325guitar it's modification, the refinish, alleged theft, and current whereabouts. The first thing that most people notice is that the guitar has no sound hole or elevated pickguard unlike almost every vintage or modern hollow-bodied Ric you'll ever see. If you examine examples of Rickenbacker's very first capris from 1958 you'll notice that they have only a single lucite control plate. It was towards the end of '58 that elevated pickguards were introduced. The run of 325's were produced very early in '58. The lack of soundhole on Lennon's 325 is harder to explain, but the feeling is that soundholes were not on the first few 325's but were quickly introduced as a visual indicator that the 325's were hollow. Without actually picking one up and feeling the exceptionally light weight, due to the alder body and extensive internal routing, they give every appearance of being a solidbody, and hence lower quality instrument. Next, if you compare Lennon's 325 to almost every other known example of '58 325 you'll notice that it is unusual in having 4 controls. Most original 325's have only 2 rotary controls and 1 pickup selector. The reason for this can be found in the 'Rickenbacker' book by Richard R. Smith. On page 162 and 163 it is noted that "the first 325 guitars had a single pickup selector switch, a volume control, and a tone control. However, later in 1958, the factory refitted the 325's still in Rickenbacker's inventory with two tone controls and two volume controls." Due to the low position of the existing two controls it can be assumed that the two additional potentiometers were added above the existing two using the same 'single' lucite plate. This would also explain the 'skewed' placement of the controls on Lennon's. The new Rickenbacker standard Rogan (stove) type knobs were likely installed in the process. Here we have another answer, John's 325 was one of the retrofitted two control 1958 325's. The British Invasion of 1964 initiated a rise in popularity of the Model 325. The Model 325C64 duplicates the Model 325 as produced in 1964—complete with semi-hollow maple body, reshaped body and headstock, 3 vintage-style single-coil pickups,rickenbacker 325 price Deluxe Vintage tuners, and Accent Vibrato. For a detailed chronology of the Rickenbacker Model 325's role in the British Invasion, check out Backbeat Books' "Beatles Gear: All The Fab Four's Instruments From Stage to Studio" (SKU #H64162). A thoroughly collectible guitar that is too nice not to play. Order today. The Rickenbacker 325 was the first of the Capri series of hollow body guitars released in 1958 byRickenbacker. It was designed by Roger Rossmeisl, a guitar craftsman from a family of German instrument makers. Production models were 20-3/4" short scale, dot fretboard inlays, and a small (12-3/4" wide) body. The body is unbound, semi-hollow, with 2 o'clock angled sound hole (although re-issues lack a sound hole due to the Lennon connection), and boasts the "crescent moon"-style cutaways. This series is currently available only in "C" reissue form. These instruments gained prominence due to John Lennon's use of a 325 during the early years of The Beatles. 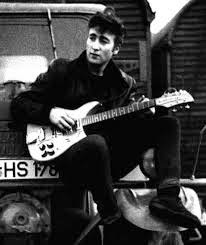 John Lennon's 1958 model was among the very first batch made and has the pre-production feature of a solid top, i.e., no sound hole. All subsequent production short-scale 300-series Rickenbackers (310, 315, 320, 325) had sound holes until the late 1970s. That said, these guitar auctions are weirdly exciting affairs. This MusicRadar writer was at Sotheby's in 1990, at the first auction of the iconic Fender Stratocaster Hendrix played at Woodstock. Everyone in the auction room was aghast when the Strat, sold by JH Experience drummer Mitch Mitchell, went for a 'huge' ?198,000. It was, back then, the most expensive guitar ever sold at auction. fender jimi hendrix monterey pop stratocaster In 2008, that money wouldn't probably buy you the shoes Jimi wore on that day. And a few years later, the Woodstock Strat was bought - as Owen says - for $1.8 million. Hendrix famously repeated his guitar burning stunt at the Monterey Pop Festival in 1967 (see Related Links), but the Astoria Strat remains the only burnt guitar that is fully intact. The only doubt in my mind over the estimated price for the Astoria Strat is this: Jimi's Monterey pyromania was caught on film and on (still) camera. For that reason alone, the Monterey Strat is possibly more iconic. The auction takes place on 4 September. The auction also includes the last surviving drum kit of Led Zeppelin's John Bonham, Jim Morrison's final notebook of poetry and musings before his death from Paris in 1971, and a songsheet for USA For Africa's We Are The World signed by the Michael Jackson, Stevie Wonder, Bruce Springsteen, Bob Dylan and more. Our brand new guitars are of lower price than Ebay, Amazon, best buy, alibaba and the other guitars selling websites. left handed guitars also sale custom shop online. 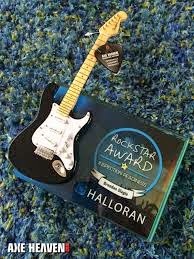 Furthermore, you can also check the guitars reviews, price, specs, photos, wiki, special, video, and news on our website of the products you are interested in. We are free shipping worldwide, we can ship to US, UK, Canada, Australia, Japan, Singapore, Malaysia, India, Europe, France, Germany, Greece, Indonesia, Italy, Mexico, New Zealand, Peru, Philippines, Poland, Portugal, Romania, Spain, Sweden, Switzerland, Thailand, Turkey, Austria, Brazil, Norway, Denmark and MORE.